"I believe in the inherent beauty of all persons and feel that plastic and reconstructive surgery enhances everyone's natural beauty". 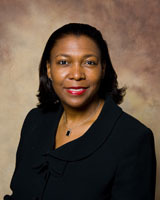 Dr. Woodberry and her team strive to treat each patient as their own family. She enjoys taking the time to listen, teach, illustrate and explain medical processes and treatments to her patients. With her love for working with her hands and her desire to bring overall health and beauty to everyone, Dr. Woodberry can help you recover from skin cancer, breast cancer and trauma with the care and compassion that her unique skills offer.